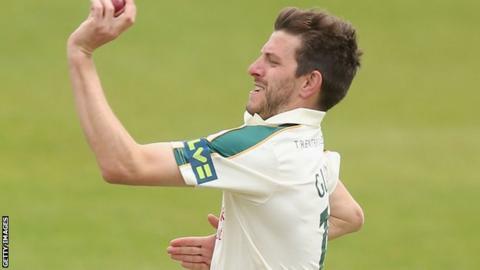 Harry Gurney took eight wickets in the match as Nottinghamshire beat Sussex by an innings and 103 runs inside three days at Horsham. Sussex resumed on 157-4 in their first innings and Gurney (5-75) helped dismiss the hosts for 213, including the wicket of Luke Wright (50). Leading by 357 runs, Notts enforced the follow-on and the home side put up more of a fight, led by Matt Machan's 108. Gurney (3-56) ended with match figures of 8-131 with Sussex all out for 254. Notts take 24 points from the game and move above Somerset into fifth in the Division One table, while Sussex - who claimed only two bonus points - remain in relegation trouble. Sussex are second from bottom with five games remaining and two of those games are against runaway leaders Yorkshire. The visitors needed only 24 overs to take Sussex's final six first-innings wickets, with 40-year-old spinner Gary Keedy - in his first Championship match of the season - finishing with 3-45. Notts enforced the follow-on for the first time since August 2013 against Somerset and the hosts lost their first wicket five balls into their second innings, with Luke Wells caught by Steven Mullaney at second slip from an angled ball by Luke Wood (3-27). Machan's 106-ball innings of 108, which included 13 fours, was ended by Mullaney's catch off Gurney and Sussex fell away after that. Wright posted his second half-century of the game with a run-a-ball 67, but was caught behind by Chris Read off Keedy, and the game was won for Notts when Wood trapped Peter Burgoyne lbw for 13. "It was a very complete three-day performance. I thought Harry Gurney had an exceptional match. He was fast and aggressive throughout and presented a challenge for the Sussex batsmen. "He bowled with serious pace and was impressive whether he was bowling left-arm over or left-arm round. What we want to do now is see him bowl like this more consistently. "It was also a tremendous effort from Gary Keedy to take five wickets, whom we made sure was ready for this game because we thought it would spin." "We have batted poorly, there's no denying that and we're now in a relegation battle, which we will be fighting as hard as we can to get out of. "I have some sympathy for our batting unit because it's never easy after the opposition have got 550. "A lot of the guys made starts, which shows they are in decent nick, but apart from Matt Machan today, who made a good hundred, and Luke Wright, who we've relied on throughout the season, we've not done well enough."